DIY: Iron-on embroidery patches. Easy peasy. DIY: I’m totally biased when it comes to browsing the jewelry section of any store. Regardless, this number can be easily replicated with a strand of suede cord and charms tied to the ends. Just wrap around your neck and you’re done. DIY: White jeans and blue fabric dye with a heavy hand. Aaaand go. 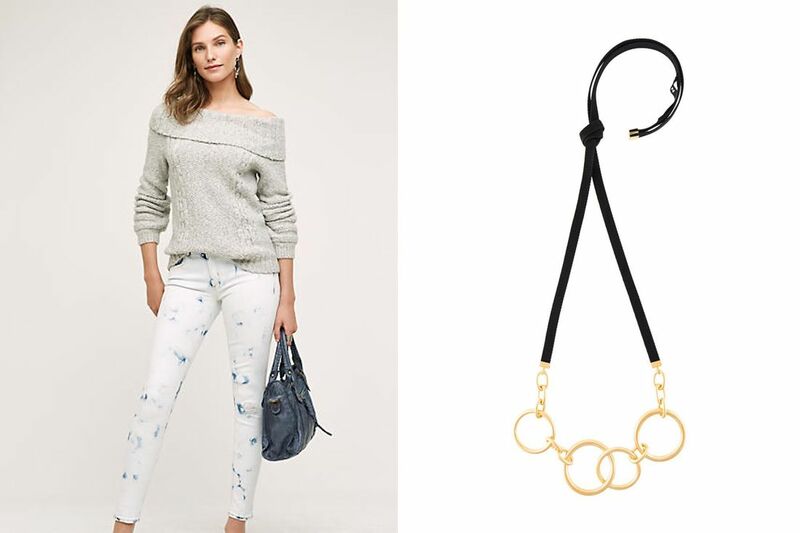 DIY: You can make a similar necklace using ribbon or flat suede cord with ribbon ends (like the ones used in this Bandanna Fabric Choker) attached to chain and key rings spray painted gold. I happen to love using key rings in jewelry making; check out an old favorite, a Thread-Wrapped Bib Necklace made with key rings. Looking for more ideas? Check out past “DIY Inspiration“ posts for more crafty goodness!